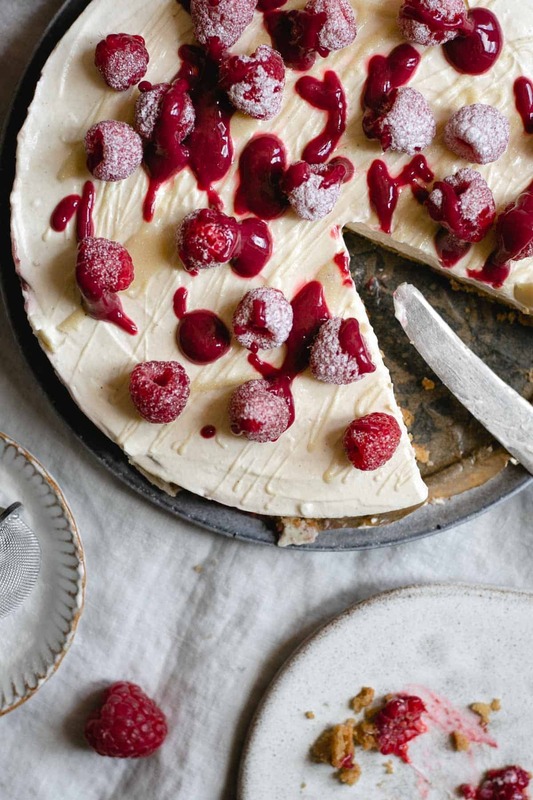 This easy raspberry and white chocolate cheesecake takes only 7 ingredients to be ready! Plus, it’s no-bake, so no need to turn your oven on in this heat to enjoy a tasty dessert! As we continue to enjoy the hottest summer on record, please excuse me my complete lack of posting here! 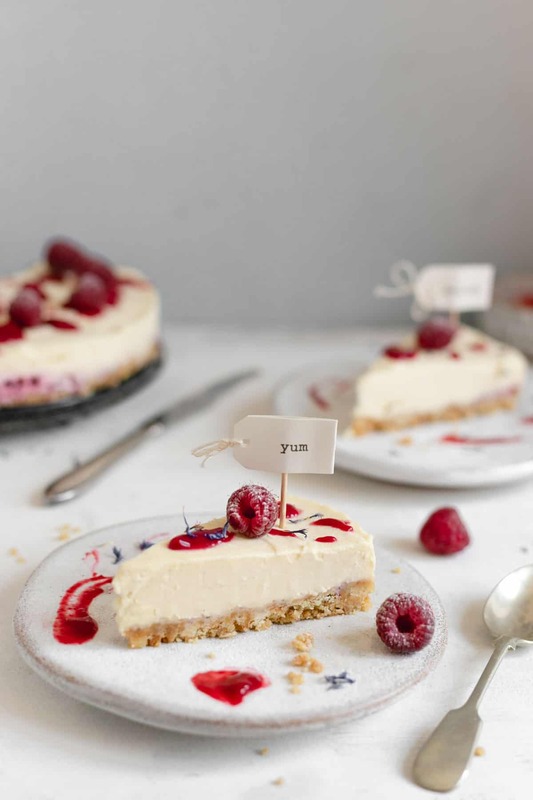 I’m sure that can be forgiven, after this incredibly delicious raspberry cheesecake recipe I have for you today! 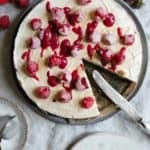 Why to make this raspberry cheesecake? If like me, you are currently enjoying one hot day after another, then surely you also suffer with a fear of turning your oven on in this weather, right? But fear not, this recipe is a no-bake, meaning you just prepare the whole thing, leave it in the fridge, and (try to) patiently wait. This means that you can still enjoy a heavenly delicious, homemade dessert without breaking a sweat in your kitchen! 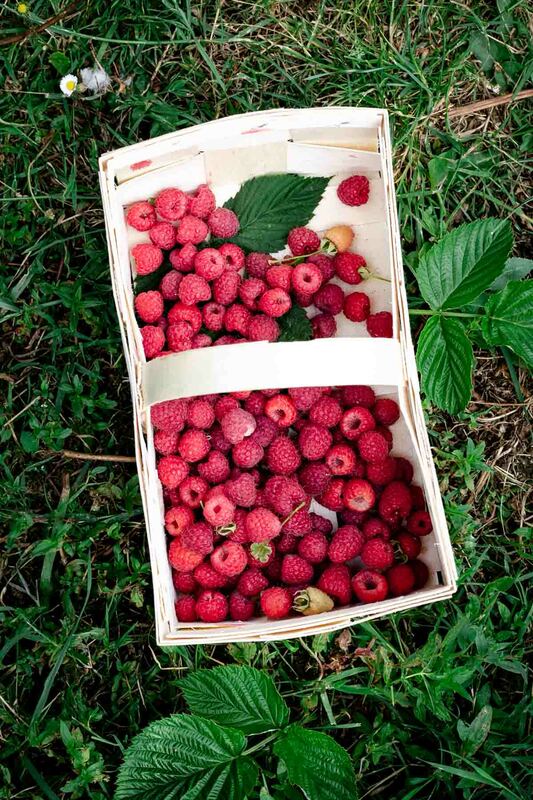 Also, the wonderful raspberries are in season, so it’s a great way of celebrating this sweet and juicy fruit! Making this recipe couldn’t be easier! Seriously, all what you need to do is crush some digestive biscuits with rolling pin, cover them with melted butter and transfer to the cake tin. 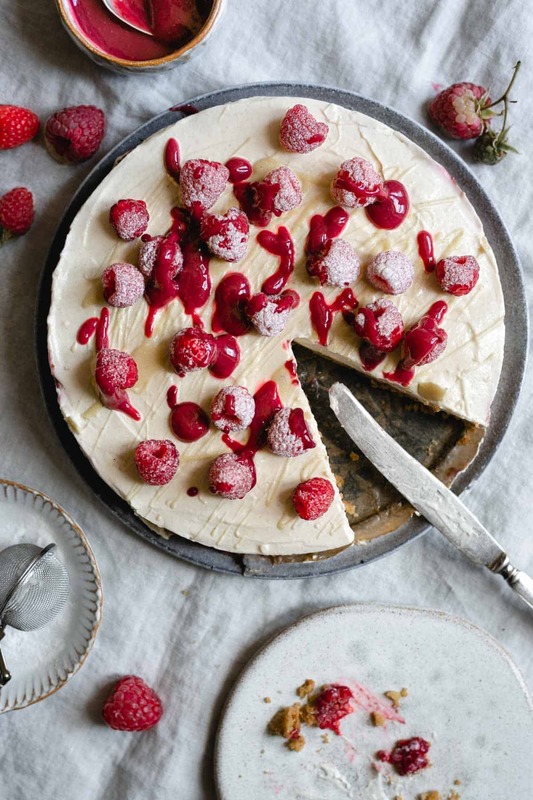 To make cheesecake filling, you just mix the mascarpone cheese with double cream, and all what’s left is to melt some chocolate and whizz some raspberries in a blender. The trickiest part of this recipe is to wait for the cheesecake to set in the fridge! Any tricky parts, when making this recipe? Honestly, it’s going to be very difficult to screw up anything in this raspberry cheesecake recipe. Perhaps the trickiest part is melting the white chocolate. Make sure your bowl is not touching the water, and keep an eye on the water itself, it should be simmering, not boiling. Once your chocolate is in the bowl, keep stirring it until it melts, and as soon as it does melt, remove the bowl from the top of the saucepan. You can also add some of the melted white chocolate to the mascarpone mix, just make sure it has cooled down (otherwise the chocolate may set in the mix). Great crowd pleaser, perfect for summer parties! 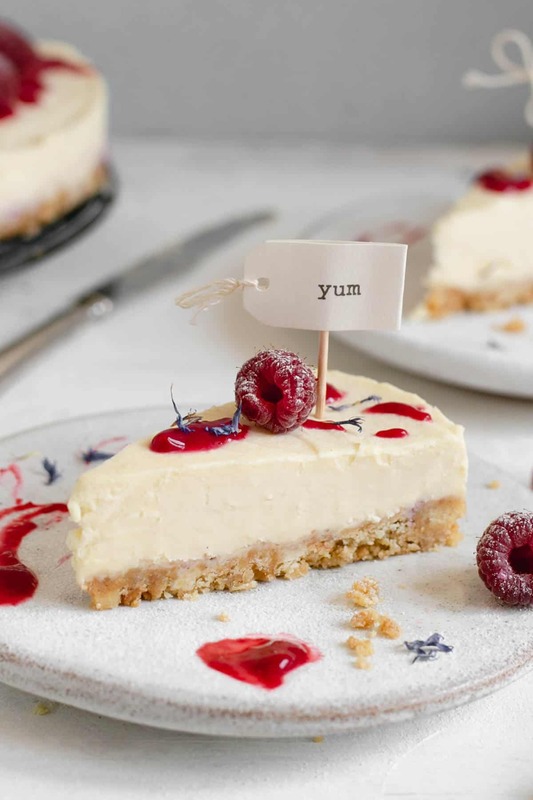 This raspberry and white chocolate cheesecake is perfect for any family or friends gatherings in the summer garden, and it can be prepared up to two days ahead, saving you all the precious time to enjoy a glass of something cool. I’ve been making it over and over again, especially at this time of the year, and seriously, not once I’ve heard someone complaining about it. It always disappears within minutes, and I’ve seen people licking their plates after it too (guilty!)! As always, let me know if you try this recipe! Leave me a comment or rating below, and let’s be friends! This no-bake, creamy raspberry and withe chocolate cheesecake will quickly become your favourite summer dessert. It's made with only a handful of ingredients and it's a guaranteed crowd pleaser! Grease and line up the base of 20-23 cm springform cake tin. 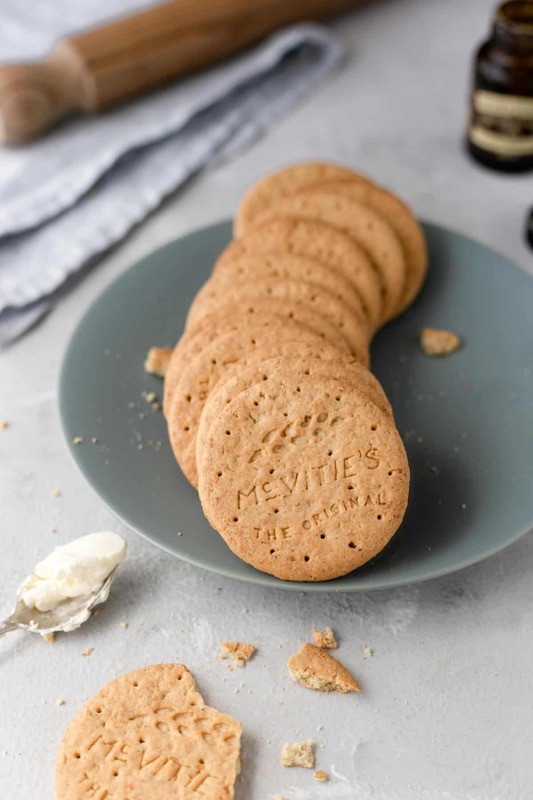 Place the digestive biscuits into a plastic bag and crush with a rolling pin, until you have fine crumbs, but leave some chunkier bits too. Place the butter in a medium saucepan and melt on a medium heat. Add crushed digestives, stir the mixture together and transfer into prepared cake tin. Press the crushed biscuits into the tin with a back of a spoon, until levelled, cover and chill in the fridge. Meanwhile, using an electric mixer, mix together the mascarpone cheese and double cream with vanilla until it is smooth and has very soft peaks. Place the chocolate in a heat-proof bowl and place on top of a pan of simmering water, stir until melted, and set aside for 5-10 minutes. Take out the cheesecake base from the fridge. Spread a layer of white chocolate over it, then top it up with mixture of mascarpone and double cream. Place half of raspberries in a blender and blitz until runny, then pour through a sieve into a bowl, discarding the seeds. Pour any remaining white chocolate over the top of the cheesecake, drizzle with raspberry coulis and decorate with remaining raspberries. This recipe works best if you allow your cheesecake to set in the fridge for at least 5 hours or overnight. This recipe can also be frozen without the raspberry decoration for up to a month. Enjoyed reading this post and recipe? Why not subscribe to my mailing list and be the first one to know when the new one comes out? Go on, you know you want to (plus, it only takes couple of seconds and will mean a world to me!)! Today’s recipe was adapted from Mary Berry’s White Chocolate and Raspberry Cheesecake recipe. This cheesecake looks glorious! Your photos are stunning! Seeing that it is made of mascarpone, I fantasize of having a slice! I love the mild, creamy profile of mascarpone and with the white chocolate, this dessert is just HEAVEN. Hi Sanna, thanks so much for your lovely comment! Mascarpone do have such a smooth and silky texture, it’s perfect for the cheesecakes! I’m glad to hear you like the recipe and the photos, thanks so much! Cheesecake is always HIT at home,I got lots of cream cheese in refrigerator and huge slab of white chocolate too,now I know my Sunday plans. Hey Prasanna, great to hear! I hope you’ve made it and the whole family enjoyed it! Thanks for stopping by! I am really reluctant to turn on my oven right now. Thanks for this recipe, my husband has a sweet tooth so this is going to be perfect. Bonus for not heating up my house right now. Hi Tina, glad to hear I’m not the only one with the fear of turning the oven on in this weather! And I hope your hubby will enjoy this recipe! I can’t believe the flavors that you have going on here. Seven ingredients and no-bake? That’s a dream come true. This would be easy to whip up for a company dinner — it looks so pretty. It certainly would make a statement — you’re special. Pinning!! Thanks so much Marisa, this really is one of the simplest and tastiest recipes, and I’m so glad to read that you like it too! This cake looks gorgeous. Love your recipe. Wish I could grab a slice. Great photos !!! Thank you very much Sri, glad to hear that you like the photos and the recipe! haha, Julie, that happens more often than you would know! It’s so easy to eat them straight from the basket, even before they make it to the kitchen! Thank you for lovely comment! I spent half the summer back home visiting my family in MidWest and it was nice waking up every morning to fresh raspberries from the bushes in the yard. I wish we had thought of a cheesecake with fresh berries! Hi Jessica, sounds like a lovely place! And hopefully, you will have this recipe handy for the next time! 😉 Thanks for stopping by! Raspberry and white choclate is such a classic combo, and everyone loves it so this is a crowd please. it just looks so pretty!!! Hey Claire! Glad to hear you are also a fan of this classic combo! It’s just a match made in heaven! Thanks so much! So perfect! Super easy to make and what a great flavor combination .. talk about perfect for summer parties too!! Hi Heather, this one is ideal for summer gatherings, you can also try it with other summer berries! Hope you will get to try it, thanks for stopping by! 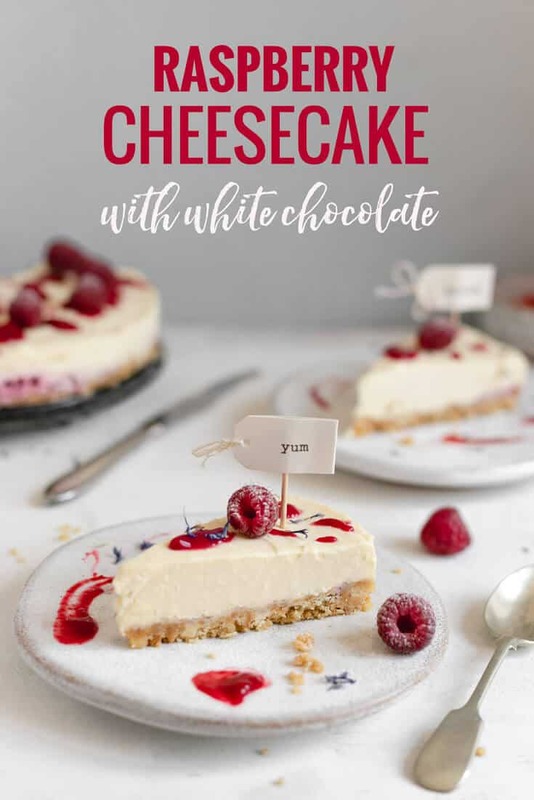 Cheesecake is my favorite dessert and raspberry is my favorite addition to any dessert so I know I have to make this! Sounds like this one is for you Kelsey! Hope you will like it! It must be awesome to have access to raspberries whenever you want them! I’m so jealous! This looks delicious! Oh Nicole, I wish! 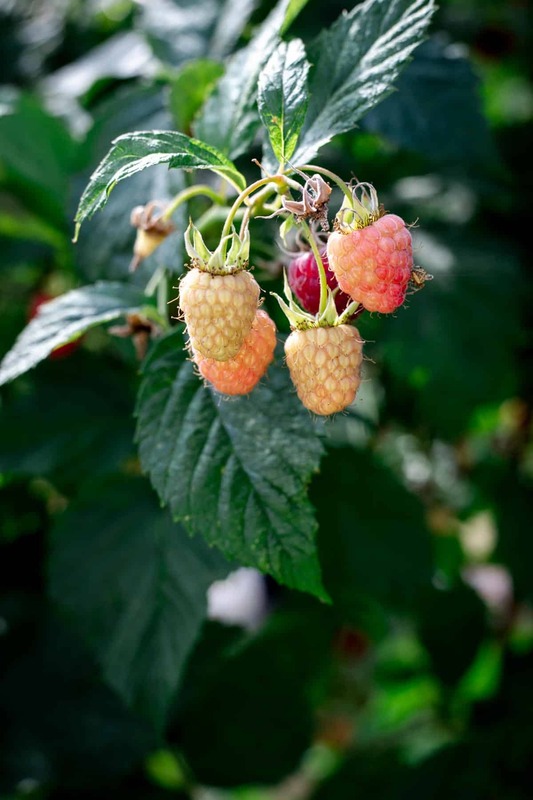 They were picked at my local PYO farm, having my own garden with raspberries included is a dream I’m hoping to materialise one day!